These flavors went so well together and that burst of heat from the chili peppers is tempered by the sweetness of the glaze. This is a great way to celebrate summertime green beans which are overflowing at farmer’s markets this time of year. Place the apple juice on medium heat. Add the outer layer of the lemongrass to the juice and reduce by one half. While the juice is reducing, add the leek, chili, garlic, cilantro, ginger and flax seed to a food processor and pulse until well combined. Add the tempeh, ponzu and lime juice. Pulse and use a spatula to reincorporate any of the mix that has climbed the processor walls. Let stand for 10 minutes so the flax meal can hydrate. Roll into marble-sized balls and place upon a non-stick baking sheet or Silpat. Lightly spray with coconut oil and bake for 30 minutes until browned. When the tempeh is halfway finished, put some water on to boil in a steamer. Steam the green beans for 5-7 minutes until cooked through but still crisp. Remove the lemongrass stalk from the apple juice reduction and stir in the miso. Add the green beans and tempeh and toss gently. This recipe looks fantastic! Thank you! It really was a very nice way to use tempeh and was delicious! I hope you enjoy. 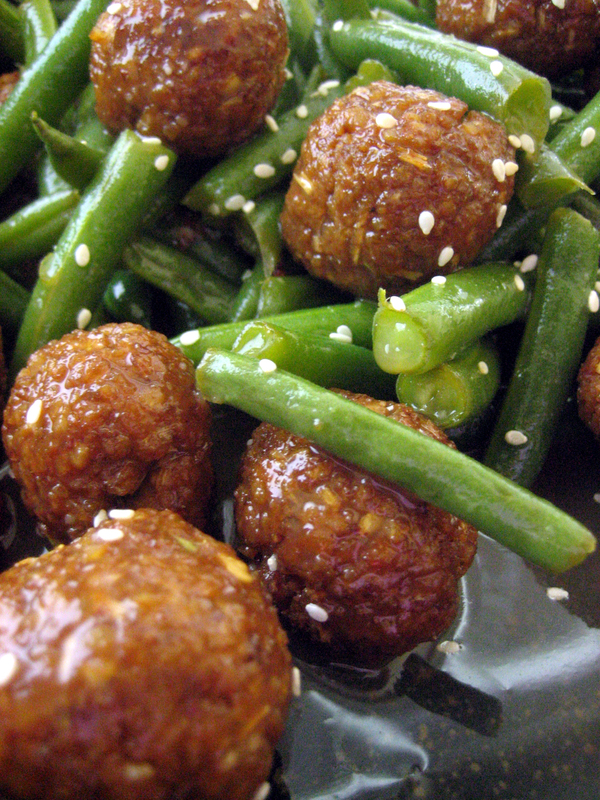 This sounds wonderful…I love that you made meatballs with the tempeh…they look so crispy and good. Thanks for the recipe…I’m definitely going to try it soon. I baked the meatballs first to give them some texture. I tried simmering tempeh meatballs once in sauce and they dissolved. If you want them crispy, I’d pan sear/fry them rather than bake them before integrating them in with the beans and glaze. The directions do not mention the inner stalk of the lemongrass. Does step one mean to say inner stalk and not outer? I only remove the tough outer layer[s]. The inner stalk will be shredded up into tiny pieces in the food processor. Hope this clarifies it for you. I find it interesting that there are no comments on the green beans:-) Since there is no mention of the quantity, I will go for what I think might be a good fit. I am making this today and looking forward to it! thx for sharing.